January has brought many storms to us here in the US and many personal ups and downs for me so far, so it was time for a little something cozy and nourishing. 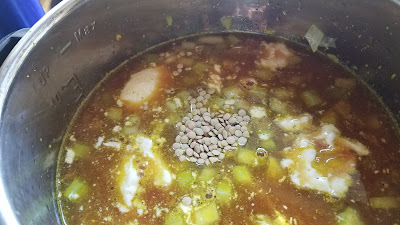 The other day I remembered a deliciously healthy soup I used to make and decided to do it in my Instant Pot Duo (full disclosure: that's an Amazon Affiliates link, so if you use it to buy that or something else, I'll make a buck or two). I'm so glad I thought of it, because it's the perfect January recipe. 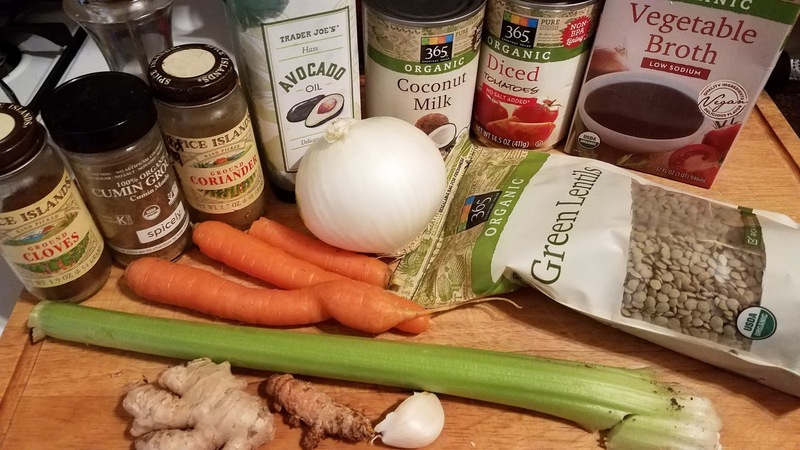 It's healthy, inexpensive, vegan...all those things that help you recover from the holidays and meet your New Year's goals. I'm not much of a New Year's resolution type myself because I've always found it better to embark on a new goal when I'm really good and ready. How many years in a row did I resolve to clean my room? But this tastes so good, earthy and spicy and warm, that you'll want to keep making it even after you've given up. It also fits into many diet programs easily, including the Always Hungry? lifestyle in all phases. I entered the ingredients into two different calculators and got two wildly different ratios of macros, so I won't share them with you so as not to confuse you. To make a balanced meal for phase 1, you'd need to add some more protein and healthy fat. 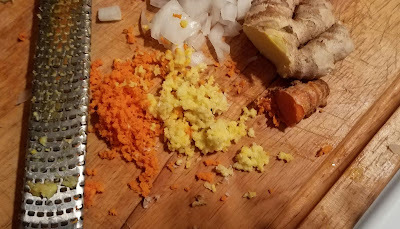 Here are the ingredients I use: you can replace all those dried spices with a tablespoon of curry powder or add some cayenne, I just can't eat those myself. Yes, I washed the celery before dicing it. 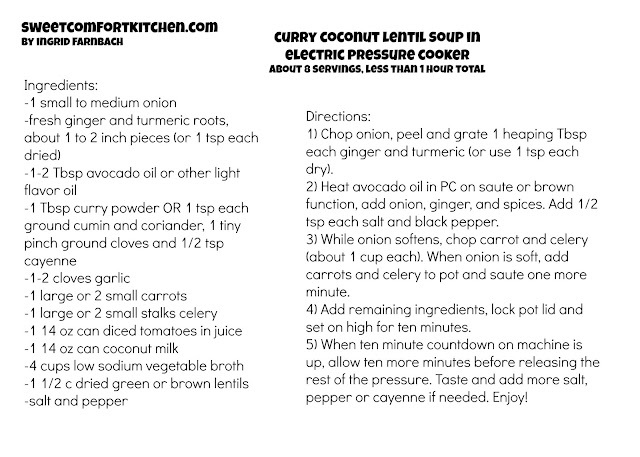 Recipe card at the end. Dice an onion, mince 1-2 cloves of garlic, and peel and grate about a heaping tablespoon each of fresh ginger and turmeric. You can use a teaspoon each of dried ginger and turmeric if you can't find fresh, but more and more markets are carrying them these days. Get the bright orange turmeric, not the white kind. It's supposed to help fight inflammation, which is a really good thing. Turn on your electric pressure cooker's saute or brown function and add 1-2 Tbsp avocado oil (or other unflavored oil, olive would even be OK here), the onions, and the ginger and turmeric. Also add a tiny pinch of cloves, 1 tsp each ground cumin and coriander, and 1/2 tsp each salt and black pepper. Add 1/2 tsp or more cayenne if you like heat. You can replace all those spices with 1 Tbsp curry powder if you prefer to keep it simple. Saute onions and spices a few minutes until soft and fragrant. It'll smell really good really fast! 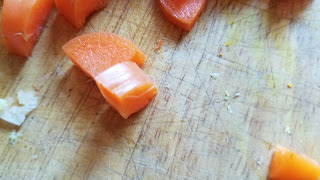 In the meantime, chop about a cup each of carrots and celery (2 small or 1 large carrot and 1 medium stalk celery) into pieces about like so. Add the garlic, celery and carrots to the pot and saute for just another minute. Because I'm using pressure, I don't want them too soft before they get cooked. If you make this on the stove, saute them another couple of minutes before adding the other stuff. 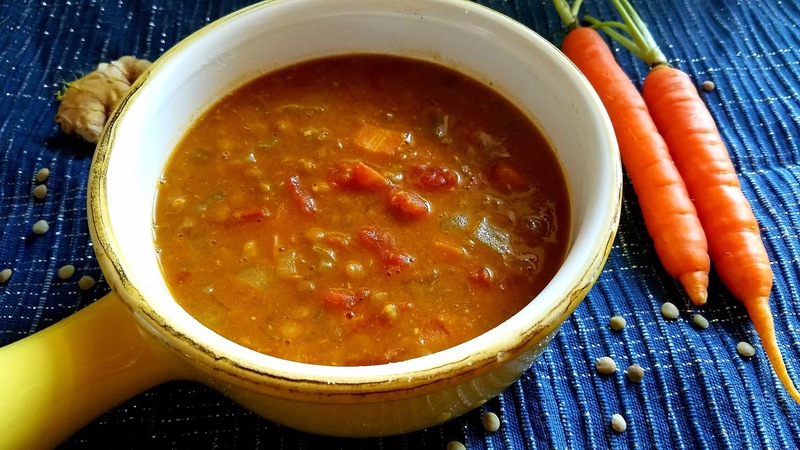 Add a 14-oz can each diced tomatoes and coconut milk, 4 cups low sodium vegetable broth, and 1 1/2 cups green or brown lentils. Don't use the fancy Lentils de Puy, because they'll stay too hard. Those are for salads. You can give it a stir, but you don't really have to. The cooker will make it all come together. Set your pressure cooker to 10 minutes high pressure and lock the lid on. Once it has come to pressure and counted down those ten minutes, let it release pressure naturally for ten more minutes before you release the rest by opening the valve. Taste it for salt and pepper, adding in a little more of whichever it needs. Mine needed more salt because I used low- and no-sodium products. Enjoy it with a little salad, a few bites of your favorite protein and maybe some chickpea crackers. Let me know if you try it!